Pics Home Lift Truck Pics Racking Pics Dock Equip. Conveyor Pics Automated Equip. Automated Material Handling Equipment is always the highlight of my visits to material handling trade shows. While you will need deep pockets for some of this equipment, the increase in productivity and storage capacity can provide a reasonable ROI in many operations. Horizontal Carousels are a type of automated material handling equipment used in high-volume small-parts picking operations. Generally, an operator will run 2 to 4 carousels at a time avoiding the need for the operator to wait while one unit is turning. Picking is usually performed in batches with orders downloaded from the host system to the carousel software. Pick-to-light systems utilizing a light tree are often integrated into carousels. Vertical Carousels consist of a series of horizontal trays on a vertical carousel. Vertical carousels are most effective when floor space is at a minimum and there is ample overhead clearance. 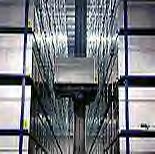 Enclosed vertical carousels offer additional security and protection for the product stored in them. 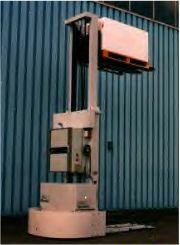 Vertical carousels are frequently used in laboratories, offices, and specialty manufacturing operations. From the outside a VLM appears to be similar to a vertical carousel however internally it operates more like an ASRS unit using a retrieval unit to bring the product to the operator. Application would be similar to a vertical carousel. Advantages of a VLM over a vertical carousel are cost, flexibility in configuration (handling different size products within same unit), and safer for sensitive products that may be damaged due to the constant motion of a carousel. Disadvantage is a slower retrieval speed than a carousel. 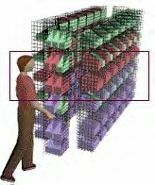 A system of rows of rack, each row has a dedicated retrieval unit that moves vertically and horizontally along the rack picking and putting away loads. ASRS systems are available in Mini-load types which store and transfer product on some type of tray or in bins and Unit-load types (shown) which transfer and store pallet loads. Courtesy of HK Systems, Inc.
Vehicles that can be programmed to automatically drive to designated points and perform preprogrammed functions. Guidance system may consist of a wire embedded in the floor, special tape, laser and optical system. Most effective where highly repetitive tasks are performed over extended distances. The variety in configurations of AGVs is endless, virtually any type of material handling equipment can be converted to an AGV. This is another version of an AGV that has added functionality to raise and lower the pallet to allow the transfer pallet loads into and out of pallet racking or to other equipment at different heights.